Saab has an official distribution network in place and plans for up to 20 retailers in the Canadian network. The Swedish brand’s Canadian game plan was revealed Tuesday at an event at Budd’s Saab in Oakville, Ont., and put to rest a number of questions swirling about the future in Canada. On hand for the kickoff were a number of key executives including Victor Muller, chairman Saab and CEO Spyker Cars NV; Jan Ake Jonsson, CEO Saab Automobile AB. The plan for the next few months includes developing a dealer network throughout Canada consisting of 15 to 20 dealers. Adrian Hallmark, executive directory of sales, says the network would most likely centre in major cities but would not reveal exactly locations. “We have already started looking back into the previous Saab network in Canada to understand where we were and where the potential is for the future,” he said. In terms of sales, he told the crowd that Canada should be at around 4,000 units yearly. 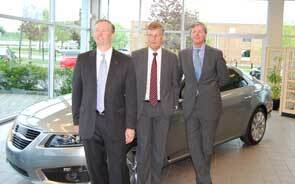 Though Saab Canada had failed to hit that mark in recent years before the bottom fell out of the market in late 2008. “If we get activated in August, it will be a small number of cars this year… 200-300 maximum,” he said, adding that the goal is to grow every year to reach about 10 per cent of the U.S. totals. International Fleet Sales, which had previously handled distribution of certain Saab brands in Canada, will handle distribution and other markets for GM. Both companies signed a memorandum of understanding that will see the new product from Sweden make its way across Canada this fall. Muller went on to talk about the new line of products, starting with the 2011 9-5 Aero sedan and the 9-3X crossover expected on the market next April.